I Hope you are having a good weekend and wherever you are, the weather is mild. 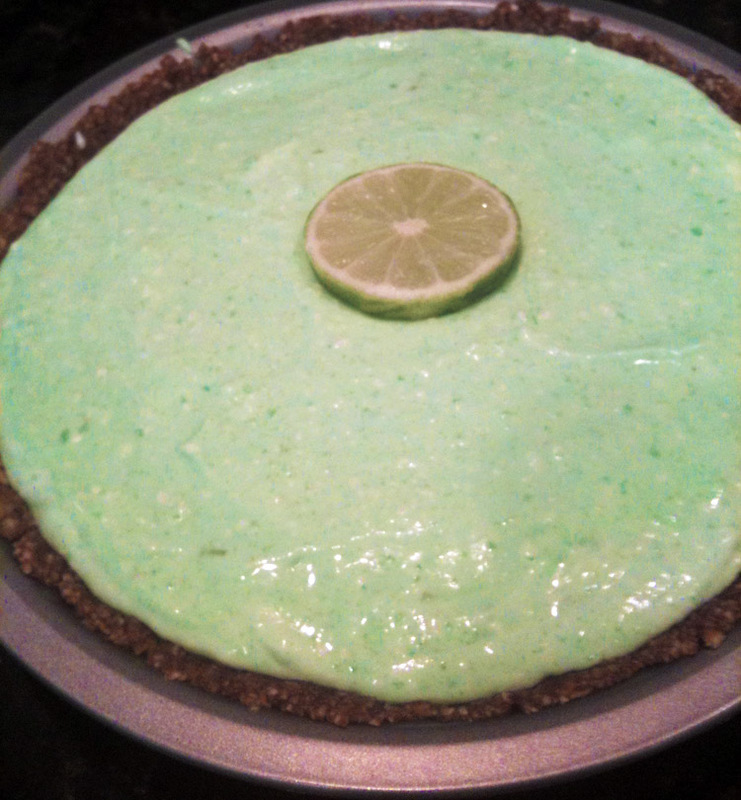 This weeks pie is the low carb version of a key lime pie. I’ll be looking for low carb versions of pie for a bit. I have found a whopping three that fit the bill. So if you have any good recipes, send them my way please. This one seemed the most in keeping with the time of year. I’ve also never done a ground pecan crust. Easy and mesmerizing. The inspiration for this pie comes from The South Beach Diet and allrecipes. I made a few mods to their recipe. In a food processor, ground up the pecans and Truvia. Add coconut extract and melted butter and blend until combined. Place in 9 inch pie plate and spread along bottom and up sides of plate. It may not look like much in relation to the pan, but this is why I say it was mesmerizing. In a medium bowl, mix together 1 cup ground pecans, butter, 2 packets sweetener, and 1/2 teaspoon coconut extract. Press firmly into bottom and up sides of an 8 inch pie plate; refrigerate until firm. In a small bowl, whip the heavy cream with 1/2 teaspoon sweetener until soft peaks form. Set aside. In a large bowl with high sides (this is important, unless you want green gelatin mix all over your kitchen), mix the gelatin with boiling water until all the gelatin has dissolved. Stir in the cold water. Using an electric mixer, slowly beat in the cream cheese. After the cream cheese is added, stir in remaining 1/2 teaspoon coconut extract, and beat at high-speed until smooth. Carefully fold in the whipped cream. With a spatula, scrape mixture into the pie crust and smooth out. Sprinkle remaining 2 tablespoons ground nuts on top (optional). Refrigerate several hours or overnight to allow gelatin to set thoroughly. I’ll have a slice after I eat dinner. During the Cowboys/Chargers pre-season game. This entry was posted in Lime Pies, Non-bake Pies and tagged Dessert, Pecan Pie, Pecans, Pie, Recipe by pieofthebeholder. Bookmark the permalink. WOW! this sounds amazing, and my husband and I just started a low carb diet. Perhaps when I get within 10 pounds of my goal weight, I will make this! Thank you for the inspiration!